Our Remodeling Division at Brown Construction offers the homeowner the highest levels of quality, craftsmanship and service. We are proud of our attention to detail and customer satisfaction is our goal. The place you call home can be all it can be and more with our unique design capabilities. Remodeling is beautifying or improving what you already have. We willingly incorporate your choice of state of the art materials in the areas of windows, doors, siding, and accessories, and roofing to fit your lifestyle. Relax or entertain on a custom built deck designed by Brown Construction. Attention to detail with a personal touch is what we strive to achieve in every area of your remodeling project. 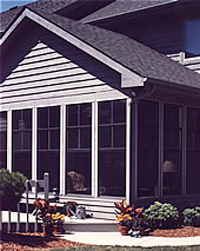 We design and build room additions, garages and small buildings in Indiana and Ohio. Consult a member of our staff today. Remodel your kitchen, bath, bedroom or basement. Call now for a free estimate.